Many people are familiar with the non-physical aspects of the individual human form ~ besides the physical body, each of us also has invisible etheric/physical, emotional, mental and soul bodies. Those who can see etherically (as mystics and intuitives) have sensitive visual apparatus enabling them to recognize these subtler aspects of the form, and in this way may assist others in tuning into them. The four overlaying etheric human bodies ~ physical etheric, astral/emotional, mental and soul ~ connect by way of channels of energy that converge in energy centers or vortexes ~ the chakras ~ as their paths form the invisible scaffolding inside of which the physical body is formed. Relating to this, when we look at charts of the human physical nervous system, or at diagrams showing the energy meridians and acupuncture points recognized and used in traditional eastern medicine, we’re seeing maps that chart the “effects” of these channels of energy and their hubs ~ namely the chakras. Our understanding of the chakra system is handed down from ancient Hindu teachings; this is where the Sanskrit word “chakra” originated. These ancient teachings have been validated over the ages in practices of meditation, yoga and healing techniques. The human body’s subtle vehicles form an aura that is actually observable: various reactions can be detected with instruments such as dowsing rods and pendulums as these react in noticeable ways when held near to one of the body’s chakras or energy centers. The lines of force forming the chakra iteslf are made up of refined particles of light energy that travel in an organized manner, inscribing patterns of light, to simplify the concept, that flow in the shape of flower petals, to which they are compared by way of description. In the human etheric body, each of the seven major centers is comprised of a different number of these so-called petals, increasing in quantity with each center moving up the spinal column. This number signifies much concerning the chakra, describing what nature of energy coalesces there. In looking at the respective functions of the seven major chakra centers, one analogy is that each of the centers is like a certain type of computer, programmed to handle different tasks and specific functions that then are synthesized in the individual’s overall personality makeup ~ the way the person experiences life and expresses themself. And as energy from the environment is channeled towards and directed away from the person, in their day to day expression, you could say it is “routed” through the appropriate computer for handling ~ that is, to the chakra that “handles” that type of energy. Each of the chakra centers in fact consists of rapidly rotating spiral-shaped openings in the front and back of the body, that act as points of transformation by regulating and distributing energy as it flows in and out of these centers. This energy then serves to stimulate the endocrine glands that control the body’s chemical balance, as well as powering the nervous system and organs. The Chakra Chart presented just below gives a comprehensive overview of the functions and other significances of the seven major chakras, plus the eighth, the Soul chakra, which we could analogize is yet another computer designed to regulate and govern the seven computer centers along the spinal column, each of which corresponds directly with important areas of the human physical body. To further assist with reading the chart, we’ll consider the Base chakra, located at the base of the spine. Known as the “first” chakra, for the system of study generally begins counting at the bottom, this chakra is seen etherically as having four petals or energy loops that rotate similarly to how electrons rotate around the nucleus of an atom ~ in the case of the root chakra, inscribing the shape of four petals in various patterns depending on the individual. 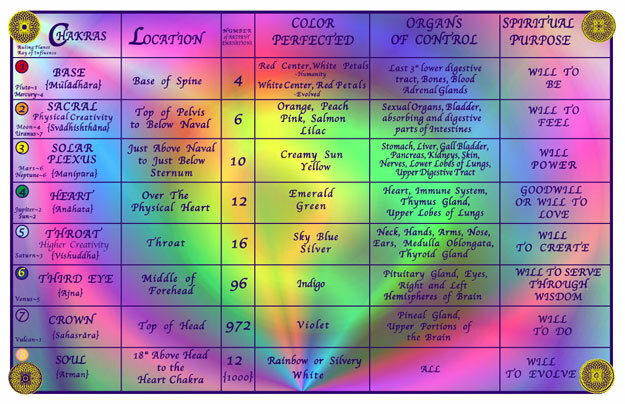 While the colors seen in the chakra petals can vary almost infinitely from person to person and even for an individual person, significantly from time to time, there are general similarities in the predominant color / s found there, these are listed on the Chakra Chart. For the first chakra, for average humanity the predominant color is red at the center, with white glowing in the petals. However for more spiritually evolved or focused humans, the center actually transforms to become white in the center, with red in the petals. The organs controlled by the base or first chakra include the last three inches of the digestive tract, the bones or skeletal system, the blood, and the adrenal glands. Actually the emotional energies focused in the first chakra are concerned with survival, such as fear. As fear and even stress are known to be connected with the adrenal glands, notice this is one way the form and the emotions “connect” in each of the chakra centers ~ each of the seven major chakras has an astral component in part forming the chakra center. For the lower three centers, there is also a mental component to each of the chakras, or energy centers. This is how the Soul, our higher mind, contacts the physical plane through the lower mind ~ the mental aspects of the three lower centers are its channel. The Soul animates the personality, “speaks to the vehicle.” Indeed, the mental and astral bodies are the eyes and ears of the Soul on the physical plane. 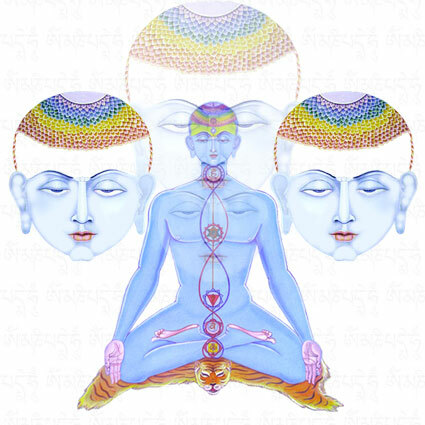 Through the mental component of the respective chakra, the mind and mental plane are affected by thought forms that flow in and out of the first, second and third centers. Whereas the higher four centers ~ the heart, throat, third eye and crown ~ instead consist of a soulic, or higher mind, aspect of the person’s mental body. Note: In all seven centers, for some people the petals are more opened and “flattened” while in others they are more closed and erect, like flower buds and their petals in varying stages of maturity. Also for each individual, depending on the situation in time and space, the size, shape and color of each chakra can vary widely; typically, when the person is agitated or disturbed, the lower chakras appear to be larger and congested with darker energy than when the person is calm and resting. While more evolved beings as well as less evolved than human incarnations also have similar chakra systems, within SouledOut.org’s Healing Arts “Wheels of Life” we’re speaking from the standpoint of the human being, the individuated soul. The fact of seven major chakra centers is more significant than one might imagine. According to the Ancient Wisdom teachings, this septenary (i.e., comprised of seven) commonality occurs throughout the universe. It’s helpful to realize when trying to understand the chakras on any level that in looking at the human chakra system and its makeup, seeing “as above, so below” provides a cross-kingdom understanding of etheric bodies and their universal nature ~ all the way up to the heavenly bodies such as stars and constellations. ~ by indigolifecenter on February 8, 2008.
there is something called seven body theory.it is connected with the chakra concept.I have mentioned it in my blog.